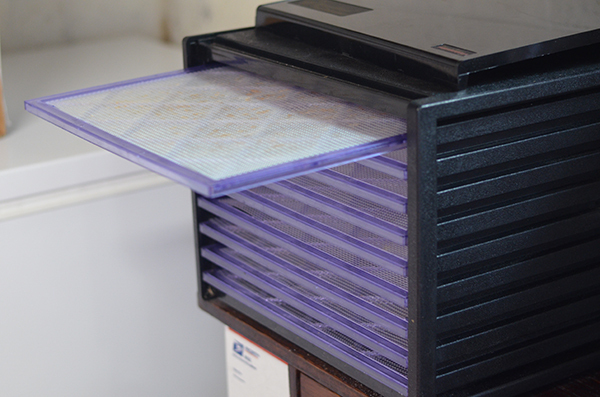 I was very blessed to be able to find a USED 9-Tray Excalibur Dehydrator: the top of the line. It got fabulous reviews and people seemed very pleased with it. An older single lady had purchased it, realized it was too large for her needs and wanted to downsize. Bingo for me! I’m telling y’all…watching Craigslist and asking around are excellent ways to find appliances. This appliance will cost you about $250 brand new – but let me tell you…if you’re into food preservation, this is an excellent appliance to add to your arsenal. It’s rather large, so I have a station set up in my basement canning area. I do my dehydrating there and it works great – it’s also where I mill grain…and where I go if I need to have a fit and not let anyone else see me. Now that I’ve used mine for a while, I am sure if I had not found one used, I would have saved and purchased it new. It’s not loud, it’s very efficient, and it makes drying things a BREEZE. The traditional dehydrating method of using your oven can give you a bit of a fit, but the Excalibur does all the work for you. You prep the food, put it in there, turn it on and leave. It’ll turn off when the timer goes off and you just come back later to dried food. Amazingly awesome. Plus it’s super easy to clean. The only thing that would make it better is if I could just put dirty dishes in there and come back and they were clean. So far all I’ve used my dehydrator for is: zucchini chips (awesome! ), drying nuts, making crackers, and incubating yogurt…because I have a tendency to forget mine is in the oven and turn it on and set diapers on fire. But today I’m going to give you a list of tons of ways you can use it…and I’m going to start using some of those ways myself, considering it’s almost harvest time around these parts! Sure! We don’t have any posts about it here on the HH blog, but I’m sure you could google it and find lots of information. Using mine right now to dry sweet potato slices for dog treats! Hi Stacy! i did read several reviews about the Excalibur dehydrator. All of the reviews were just what you said, top of the line. Which model do you have.. thank you! Hi Lynn! I use the 9-tray Economy Excalibur Dehydrator. It’s an older version so I’m not exactly sure about model #’s but I think that’s enough information to point you in a right direction! Being new to dehydrating foods, what are the options for correctly storing dehydrated foods? ie: avoiding mold or spoilage? How long will dehydrated foods last? Is this considered a way of food preservation? Is there any risk of candida with drying fruits? Which is better? canning vs. dehydration? I have an Excalibur dehydrator and it’s great. I often get fruit on sale at our discount grocery and Iove how easy it is to dehydrate it and use it later. Also great for our surplus garden produce too. I’m going to try using the dehydrator the next time I need to make homemade dairy free yogurt and see how it works. Thanks for sharing my link to drying cherries. 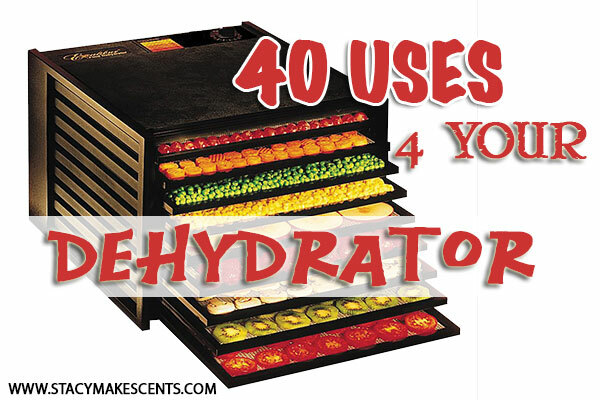 I have a dehydrator and love it! I’m thinking about trying to figure out a way to switch the fan off for a curing box for my summer sausage. Any ideas? I would check Pinterest and see if anyone else has done it. Sure, as long as you link back. 🙂 Thanks! You just sparked the idea that it would make an excellent Natto. Thanks! I needed this. I like to cut tortillias into eight pieces, lay on the screen and dehydrate. You then tortillia chips! They are so good and crispy and you put any kind of seasoning on them. I just like them plain. Sorry for not searching first!! I should have known you’d beaten me to the punch; weeks ago too! Thanks for the advice and ideas…. 🙂 Nah….I’m behind on my posting ideas. Ha! I always try to link back. 🙂 Thanks for hosting! Hi Stacy! What a wonderful post. I wish I knew half of these before I gave away my dehydrator. I just have to share this with my followers. I’m featuring this at tomorrow’s Thriving on Thursdays. Thanks for linking up. What a great collection of ideas! Thanks for linking up with Let’s Get Real! Hope our readers stop by to see this! This would be awesome to use with my blackberries, raspberries, and blueberries not to mention the rest of the fruit and veggies around here. I was wondering, with the dehydrator, they sell plastic sheets to use with it for more “liquidy” things. Do you use these, or could you use parchment paper instead? Which ones would you recommend, the premium or the ultra non stick? 🙂 Keep an eye peeled for an awesome deal on a used one! Keep an eye peeled on Craig’s List! 🙂 I love buying used. Awesome! I’ve been thinking of getting one these for my mother-in-law who has a very extensive herb garden, but the price tag always makes me a little nervous. I was thrilled to find a raw “bacon” recipe tonight! Score! Yep! Nori Wraps….Crispy Nuts…Flax Crackers. Yummy. 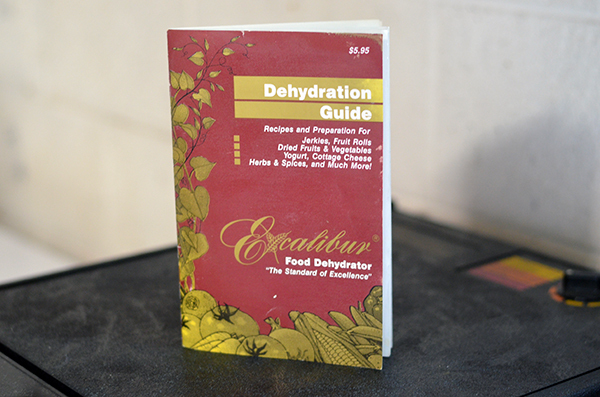 I’ve never tried a dehydrator but my THM book calls for one in a few of the recipes. This looks great! I have dreamed of owning one of these, in my lifetime. I would just love to win one of those. I have 3 teenagers and a 7 yr old. Good health quick snacks are a must at our house. Yes, it sounds like it. 🙂 I hear that teenagers can really eat! I am totally bookmarking this page … even without the giveaway, I am SO needing this right now! They’re so much fun to play with AND useful! Hi Stacy ~ I have the same model and I LOVE it! 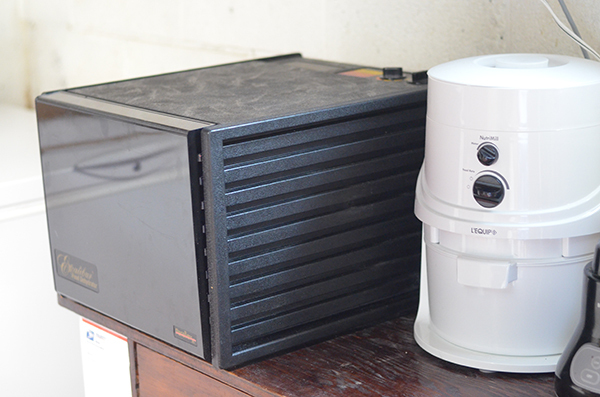 I also had a station set up for dehydrating in my garage. Just an FYI–I used to set a timer and hope I was home when it went off, but then I started using one of the little automatic appliance timers on the plug-in thingy and it works great–I got the idea from using the same thing on my Crock Pot since I didn’t have one with a timer and I had a full time job at the time and never knew when I was getting home from work. The timer works really well with the dehydrator as well. My latest creation in the dehydrator is yummy kale crackers that are made with soaked almonds, nutritional yeast, lots of chopped up kale and a few other spices. they are my THM go to for something S and crunchy! BTW–I just love THM Tuesdays–wouldn’t miss them for the world! You are terrific! I would LOVE to have a better dehydrator. We use ours to make jerky and dry bananas and other fruit mostly. I haven’t ventured into jerky yet…for some reason, it kinda scares me – even though I LOVE to eat it! LOL LOL LOL Oh dear – that really made me laugh! I bought some nutritional yeast and forgot why, so now I have this can. What do I use it for????? What if you don’t have instagram? That just means you won’t be able to use that entry method. You forgot #41 Make banana Bread Walnuts (http://naturallysavvy.com/Eat/raw-banana-bread-walnuts) and then go eat them with a little breakfast salad of chopped dates, bananas and oranges. Scoop of cottage cheese optional. You’re welcome. Dude. LOVE my Excalibur! I especially love the non-stick sheets- but I bought an off-brand on Amazon rather than the official Excalibur ones. We make lots of fruit leather on those sheets- sooooo easy! My favorite fruit leather tip- blend fruits together with pears. Pears make it more pliable and chewy. For example, apricots make a crisp, tough leather, but if you blend in pears, you get a sweeter, more flexible and thicker leather. For fruits that tend to brown while drying (like banana, apple, etc.) add a few mulberries or other berry to make the leather prettier. Before I knew this, I had people stopping me in the street to tell me my three year old was eating a huge dry leaf or a paper bag, when in reality she was chewing on a not-so-pretty but oh-so-yummy fruit leather! I have those too….I think they might also be including those in the giveaway – but I’m not 100% sure. I’d like to win that basement room! I grind my grain in the front yard to avoid the mess and who knows what the neighbors think is going on . . . If the neighbors don’t think you’re kooky, you’re doing something wrong. I have wanted one of these for a year!!! Thank you for such an informative post for when I am able to get one. Thanks for the giveaway.